At the very beginning of the film The Shallows, what we are seeing is coming from the perspective of a GoPro camera attached to the head of a surfer, and director Jaume Collet-Serra wastes no times introducing the audience to the villain of the picture. The shark strikes and we know the gruesome fate of someone in the film, but who? When we first see a character wearing a camera, we have our answer, but rather than take something away from the experience by eliminating the surprise of his death, instead the tension multiplies exponentially as my mind immediately begins to wonder not if but when? Sometimes the scariest thing is not the unknown but rather the known. What we see coming but cannot stop. That initial footage serves as a storytelling device meant to briefly flash forward in order to present the grim details of what is about to happen, but then we go back to the start. A young woman named Nancy (Blake Lively) is riding passenger in a vehicle and it's clear that she is a fish out of water (pun intended) struggling with a language barrier with the man driving her to a beach in Mexico. Not just any average location to surf, but a place that holds a significant importance to her. A place Nancy shared with her late mother. A spot to grieve and reflect and do what she loves to do all at once. Clocking in at under 80 minutes of actual running time, The Shallows still manages to demonstrate patience in order to build tension despite such a short length. Nancy is given ample time to admire the beauty of her surroundings, stand confidently on her board through some picturesque waves and also talk a bit with two young men that came to the very same spot to surf. One of them is wearing a GoPro camera on his head. We know it's coming. Not if, but when. Eventually the shark does attack and its bite is ferocious. The screams were ringing through my ears and while not original or unique imagery, the way the water slowly turns red struck a chord with me because I found myself thinking about what a tragic final representation it was for an entire life of a human being. Everything they have already done and everything they were still yet to do, gone. Just a cloud of red amidst a sea of blue. The film itself is, for the most part, a simple story of survival, a woman versus the brutal realities of nature, but rather than just an onslaught of action and carnage, Collet-Serra turns the film itself into our version of what the beach was supposed to be for Nancy. A spot for all of us to grieve and reflect, to ponder the extraordinary value of something as seemingly obvious as being lucky enough to live the next day. Unfortunately the blessings of this film also ended up being a bit of a curse, as a lot of the power of the minimalist narrative resides in the quiet moments and yet the enthralling first act transitions into a second act that loses some steam and ends up feeling the weight of redundancy. The way the setting is utilized by giving Nancy really fascinating places to find survive, like the floating corpse of a whale or a tiny bed of rocks elevated out of the water just enough to promise her temporary relief from certain death, ends up being the outstanding touches that create memorable moments beyond just fast swimming and underwater shots of a shark. The problem is I eventually started to become a little bit numb towards each new injury and the close calls of each kind, whether they be Nancy just getting her feet out of the water in time or the occasional person or boat in shouting distance that could be her saving grace, but we all know it can't be that simple. Despite this drag in the middle, everything leads up to a tense and excellently filmed conclusion that had me genuinely wondering if The Shallows would have the happy ending I had expected all along or go in a very different, very dark direction. The only issue at this point in the film is the shark itself, which had otherwise been shot and portrayed very realistically but poor CG rears its ugly head and the creature is suddenly cartoonish. During this final act we are given really poetic and moving moments in which Nancy honors her mother by promising to fight like she did, and even if they are a bit cliche in terms of stirring up emotions, it all works. I found myself moved and rooting for her to fight. 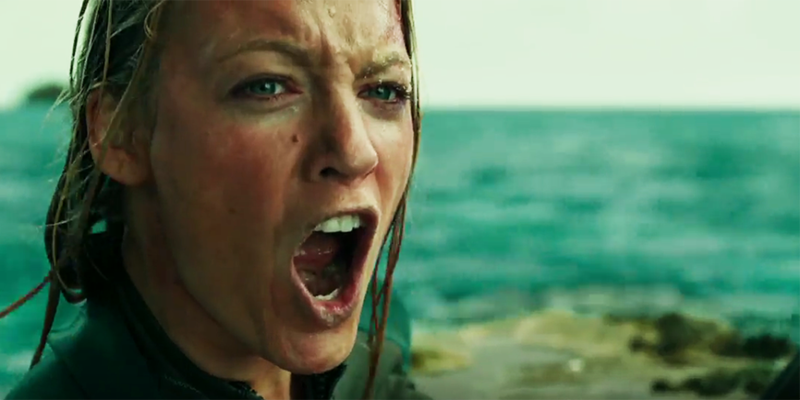 Despite the occasional presence of other actors in the film, The Shallows is Blake Lively's vehicle to prove to the world that she can act and hot damn does she prove it. I'm sure some will pay for a ticket solely for a beautiful woman in a bikini but what they will also witness is easily the most impressive moment of a young career, when she was asked to display pain, fear, strength, and courage all in a small amount of time and completely sold me on every moment. Even when the film loses a bit of its edge in the middle portion, I was still invested in her and trying to figure out a path to safety, lost in that wonderful realm cinema can create where fiction and reality blur. I only wish the entire film would have had the same bite for me as it did during the first and third acts.